Tough to the line was Lord Barrington at Ballarat on Sunday, the consistent four-year-old rising in class against a nice field of BM70 horses and doing a good job at just his third run back from a spell. Well ridden by Jordan Childs, the Darci Brahma gelding wanted to do a bit wrong during the early stages... "he just wanted to over-race a bit but as soon as he got behind horses he dropped the bit nicely." "He had a bit of a look around when he hit the lead," Childs continued, "but he was able to go through his gears nicely and he was strong to the line." "It was a good game win," Michael Moroney said, "a nice effort considering that he is better when there is a bit of sting out of the ground." Also in recent winning form is Power Of Patch who relished a step up to 1600m when breaking his maiden at Hawkesbury. "He is a really nice horse in the making," Moroney enthused, adding that "all going well he will head to the Queensland Derby." We have three horses contesting midweek events kicking off with Battle Zone who heads to Geelong on Tuesday with Jordan Childs to ride. "He has drawn a bit of a tricky gate (13) but he comes off a nice win and he has trained on well." "We think he will mature into a nice stayer at some stage," Moroney said of the son of Zabeel. 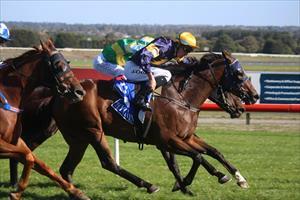 Also shooting for two in a row is Space who lines up in the 2400m race at Sandown on Wednesday, Mark Zahra to ride. "He has trained on very well and once he strikes form he tends to hold it. He should prove hard to beat again." Meanwhile in Sydney on Wednesday we have Nordic Duke taking his place in the 1600m handicap with Christian Reith aboard. "There has been a lot of rain up here which helps him, it is just what he wants." "He looks really well and I think second up he should start showing some form." In other stable news Alaskan Rose, who recorded the fastest final sections with her barnstorming second in last weekend's Adrian Knox Stakes, has come through the race well and looks set to take on Australia's best fillies in Saturday's Oaks.